I have a MacBook Pro (Retina, 15-inch, Mid 2015) running 10.13.6 and I am now getting "Bluetooth: Not Available" in the menu bar. 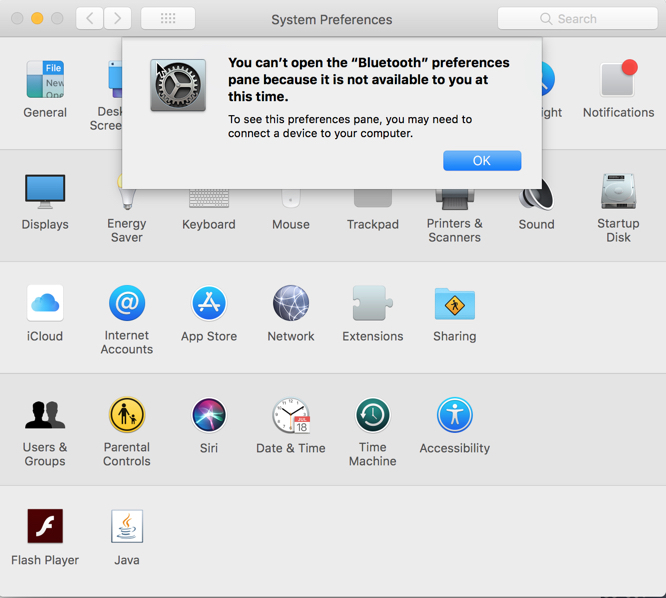 I also cannot access the "Bluetooth" section within System Preferences. Under "Network" in System Preferences it says "Bluetooth PAN is not connected" and "No PAN devices found". Under System Report, it says "No Information Found" under Bluetooth. I'm unable to reset the Bluetooth module as Shift+Option and clicking on the Bluetooth menu in the menu bar does give me an options. What other options do I have to troubleshoot this? If this is a hardware issue, do you have a recommendation for a Bluetooth USB adapter that I can use to limp by with? If one reset of the SMC doesn't restore the function, you've done all the triage except for one last ditch option before hardware repair or dropping an USB BTLE adapter on. Install a clean new 10.14 Mojave installation onto an external drive and let it update the firmware and then test without any user data migration or app installations. A total clean OS install can sometimes restore the drivers or state of the adapter if it's hung up and not a hardware issue. In terminal, also remove the com.apple.driver.AppleBluetoothMultitouch.trackpad.plist and com.apple.driver.AppleBluetoothMultitouch.mouse.plist files from ~/Library/Preferences. Then restart. That fixed it for me. Not the answer you're looking for? Browse other questions tagged high-sierra bluetooth .